SpaceX launched its second mission in two months for Telesat Canada Sunday, with a Falcon 9 rocket placing the Telstar 18V satellite into geostationary transfer orbit. Falcon lifted off from the Cape Canaveral Air Force Station during a four-hour window opening at 23:28 Eastern time (03:28 UTC on Monday) – with a T-0 moved to 00:45 (04:45 UTC) due to poor weather – and took just over thirty-two minutes to complete its mission. Telstar 18 Vantage, or Telstar 18V, is the latest spacecraft to be launched as Telesat Canada upgrades its fleet of geostationary communications satellites. Like the aging Telstar 18 satellite which it is expected to replace, Telstar 18V will be jointly operated by Telesat and the Hong Kong-based APT Satellite Company, who have designated the spacecraft APStar-5C. Space Systems/Loral constructed Telstar 18V, which is based on the SSL-1300 platform. At launch, the satellite had a mass of about 7,060 kilograms (15,600 lb) and a design life of fifteen years. It carries a payload of high-throughput C- and Ku-band transponders that will support video, data and mobile communications in the Asia-Pacific region. Once it reaches its final geostationary orbit, Telstar 18V will be stationed over the equator at a longitude of 138 degrees East – above the Pacific Ocean just north of the Indonesian province of Papua. From this slot the satellite’s C-band transponders will cover much of Asia, Australasia and parts of the Pacific Ocean including Hawaii. The Ku-band payload will cover specific markets, with beams targeting Western Australia and New Zealand, China, Indonesia and Malaysia, Indochina, Mongolia and providing regional coverage of the North Pacific. The Telstar 18 satellite that will be replaced by Telstar 18V was deployed by Sea Launch in June 2004, lifting off from the ocean-based Odyssey launch platform atop a three-stage Zenit-3SL rocket. The rocket’s Blok DM-SL upper stage cut out about fifty seconds earlier than planned, leaving Telstar 18 in a lower-than-planned deployment orbit. Despite having to burn fuel that had been intended for station-keeping to correct its orbit, Telstar 18 has exceeded its planned thirteen-year service life. Telesat acquired the Telstar fleet – which it operates in addition to its Anik and Nimiq series of spacecraft – in a 2007 merger with Loral Skynet. The Telstar series dates back to the early 1980s, when AT&T looked to establish its own fleet of satellites with the Telstar 301, 302 and 303 spacecraft. Telstar 301 was launched by a Delta 3920/PAM-D rocket in July 1983, with Telstars 302 and 303 being deployed from Space Shuttle Discovery during 1984’s STS-41D and 1985’s STS-51G missions respectively. The name Telstar itself dates back further, to the first commercial satellite – Telstar 1 – which was launched in July 1962 as an experimental low Earth orbit active communications satellite. Low orbit communications satellites quickly fell out of favor after NASA’s Syncom missions proved that geostationary orbits were more practical for communications. By matching the speed of the Earth’s rotation, a geostationary satellite can remain at a near-fixed point relative to the surface, allowing a single satellite to provide continuous coverage of a region and eliminating the need for users to reorient their receivers as the satellite moves across the sky. The Telstar 300-series satellites were followed by the short-lived Telstars 401 and 402: the latter of which exploded in orbit shortly after deployment in 1993, while Telstar 401 stopped operating within three years due to damage sustained during a magnetic storm. A replacement, Telstar 402R, was launched in 1995. This was renamed Telstar 4 in 1997, after Loral purchased the fleet. Further satellites, Telstars 5, 6 and 7, were launched in the late 1990s, while Orion Network Systems’ Orion 1 and Orion 2 spacecraft were added to the fleet as Telstar 10 and Telstar 11 following a 1998 takeover. Telstar 13 was launched in August 2003. To help alleviate financial issues, Loral sold Telstars 5, 6, 7 and 13 to Intelsat in 2003, along with the Telstar 8 satellite that was still under construction. Telstar 4 was also to have been part of the deal, but it failed before the sale could be finalized. The penultimate satellite to be launched under Loral’s ownership was Telstar 14, deployed by a Zenit-3SL rocket in January 2004. One of the satellite’s solar panels failed to deploy, however it was still able to enter service with a reduced capacity. Telstar 18 was launched in June 2004. After Telesat acquired Telstar in 2007, its first launch was the 2009 deployment of Telstar 11N to replace the fifteen-year-old Telstar 11. In 2011, Telstar 14R was launched to replace Telstar 14, although the satellite suffered the same solar array malfunction as had afflicted its predecessor. Telstar 18V is the third geostationary “Vantage” satellite to be launched for Telesat. The Vantage designation, which the company has applied to its newest generation of high-throughput satellites, is intended to signify their additional capabilities over the spacecraft they are replacing. Telstar 12V was launched aboard a Japanese H-IIA rocket in 2015, while Telstar 19V was deployed by a Falcon 9 in July. In addition to its geostationary fleet, Telesat has been experimenting with low Earth orbit communications via two miniature satellites, as a precursor to a possible network of spacecraft. One of these satellites was destroyed after a Russian Soyuz rocket failed to achieve orbit last year, however the second was deployed by India’s Polar Satellite Launch Vehicle in January. Telstar 18V rode to orbit atop SpaceX’s Falcon 9 rocket. First flown in 2010, Falcon 9 is the only rocket currently flying that is partially reusable, with the rocket’s first stage able to fly back to Earth – either back to its launch site or a landing platform at sea – for refurbishment and use on future missions. Sunday’s launch use a newly-built rocket, with the first stage designated Core 1049.1. However, it was once again recovered after completing its role in the mission and will fly again. Founded by entrepreneur Elon Musk, Space Exploration Technologies Corporation – or SpaceX – was formed with the goal of reducing the cost of access to space, with a view to future human colonization of Mars. 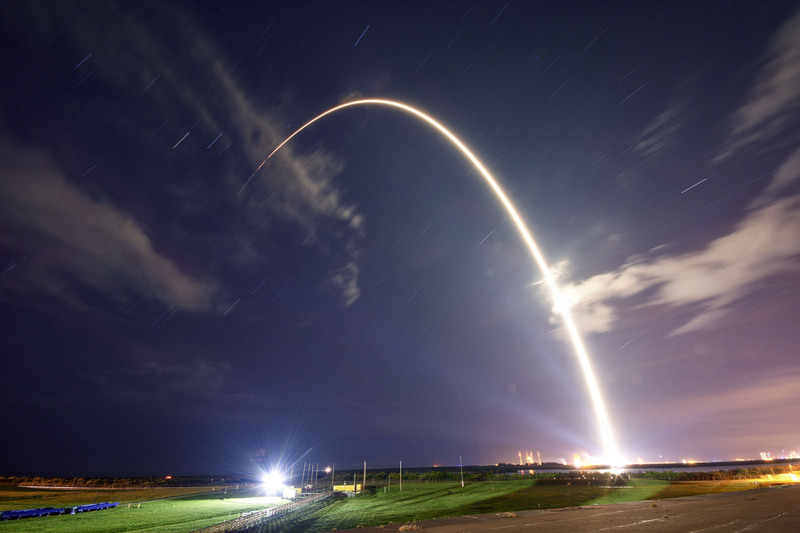 The company made its first satellite launch attempt in 2006 with the Falcon 1 rocket – achieving success at the fourth attempt two and a half years later. Falcon 1 served as a pathfinder for the much larger Falcon 9 and was retired after its fifth launch deployed SpaceX’s first commercial payload in July 2009. Prior to Sunday’s launch, Falcon 9 had made sixty flights – with its only failure coming in 2015, when a helium tank broke loose during the ascent, causing the second stage oxidizer tank to overpressurize and rupture, with the loss of the CRS-7 Dragon resupply mission bound for the International Space Station. One of Falcon 9’s early launches suffered an engine failure during first stage flight: the rocket was still able to deliver its primary payload – also a Dragon – to the correct orbit, but a second satellite aboard the rocket was a total loss. In September 2016 a Falcon 9 exploded during fuelling ahead of a ground test – a static fire a few days before the planned launch of Israel’s Amos 6 communications satellite. The rocket, and the satellite which was mated to it at the time of the accident, were destroyed. 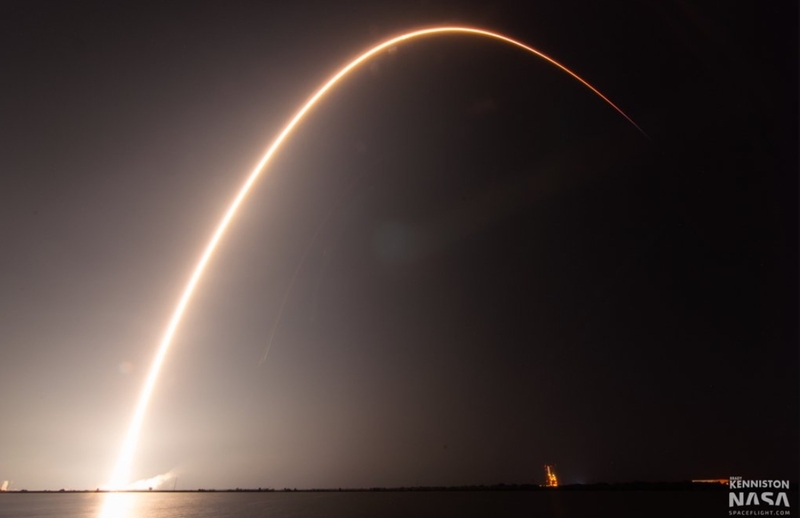 Despite these incidents, Falcon 9 has proven itself a reliable workhorse for the commercial space industry and has flown forty-one consecutive successful missions – thirty-two of these since the testing accident involving Amos 6 – prior to Sunday’s launch. From next year, Falcon 9 is expected to carry NASA astronauts on missions to the International Space Station aboard SpaceX’s new Dragon v2 spacecraft – one of two Commercial Crew vehicles that the United States is developing. The second Commercial Crew vehicle – Boeing’s Starliner – will be launched by United Launch Alliance’s Atlas V.
Sunday’s launch took place from Space Launch Complex 40 (SLC-40) at the Cape Canaveral Air Force Station. Originally built in the 1960s, this launch pad formed part of the Integrate-Transfer-Launch (ITL) complex for Titan rockets – alongside nearby Space Launch Complex 41, which is now used by the Atlas V. Between 1966 and 2005, fifty-five Titan III(23)C, Titan III(34)D, Commercial Titan III and Titan IV rockets flew from Complex 40. After the Titan IV was retired from service, SpaceX leased SLC-40 from the US Air Force in 2007, demolishing its fixed and mobile service structures the following year in favor of a clean pad approach. SpaceX integrates the Falcon 9 horizontally in a hangar they have built close to the launch pad. The rocket is rolled out to its launch position atop a transporter-erector, known as the Strongback, for a static fire test a few days before the planned launch. For the Telstar 18V launch, the static fire was performed on Wednesday morning. Since the Amos 6 accident, SpaceX has not attempted a static fire with a payload aboard its rocket, so after the test was complete the rocket was rolled back to its hangar for mating with it payload fairing, within which the Telstar satellite was encapsulated. The rocket was then returned to the launch pad. Falcon 9 is a two-stage rocket, with both stages burning RP-1 propellant – a refined form of kerosene – oxidized by subcooled liquid oxygen. Fuelling of the rocket occurs late in the countdown – with the launch director giving a “go” for the operation to begin 38 minutes ahead of the planned liftoff. Loading of RP-1 onto both stages and liquid oxygen into the first stage tanks commenced about three minutes later. Second stage oxidizer loading began about sixteen minutes before launch. The final minutes of the countdown saw a series of final checks and vehicle arming processes performed. Seven minutes before liftoff chilldown of the rocket’s first stage engines began, preparing them for the liquid oxygen that was pumped into their combustion chambers at ignition. About four minutes and fifteen seconds before liftoff, the arms that secure Falcon 9 to the strongback began to open with the strongback itself retracting slightly away from the rocket half a minute later. This initial retraction was followed by the structure moving rapidly to its fully retracted position at the moment of liftoff. Within the last minute of the countdown, the rocket’s onboard computers were commanded to perform final checks before liftoff and the propellant tanks were brought up to flight pressure. With about forty-five seconds remaining the launch director gave a final “go” for launch. The first stage is powered by nine Merlin-1D engines, which are arranged in an octagonal pattern known as the OctaWeb. These began their ignition sequence about three seconds before the zero mark in the countdown. At T-0, Falcon 9 lifted off to begin its sixty-first mission. After clearing Space Launch Complex 40’s lightning protection towers the rocket maneuvered onto an easterly launch azimuth, taking it out over the Atlantic Ocean. Sixty-seven seconds into flight the vehicle passed through the area of maximum dynamic pressure, Max-Q, where the combination of speed and outside air density – which decreases as the rocket ascends – places Falcon under peak mechanical stress. Two minutes and 33 seconds after lifting off, Falcon reached the point of main engine cutoff (MECO). This is where the first stage, having fulfilled its role in the mission, shut down its engines before separating from the second stage, which continued to boost Telstar 18V towards orbit. Separation of the two stages took place four seconds after MECO, with the second stage igniting its Merlin Vacuum (MVac) engine – a version of the Merlin-1D optimized for operation in the vacuum of space – eight seconds later. While the second stage continues towards orbit, the first stage – Core 1049 – performed a series of maneuvers as it returned to Earth for recovery and future reuse. Shortly after separation, the booster reoriented itself for reentry into Earth’s atmosphere and deployed grid fins to help stabilize and guide its descent. At about three minutes and 40 seconds after staging, three engines restarted for a brief entry burn, slowing the core as it passed back into the atmosphere in order to limit heating that could cause damage. A little under two minutes after making its entry burn, the first stage begin its landing burn as it approached the Autonomous Spaceport Drone Ship (ASDS), a landing platform based on a converted barge that has been towed out into the Atlantic in preparation for Sunday’s mission. The ASDS that was used for this mission is named Of Course I Still Love You, after a ship in the Culture series of novels by author Iain M. Banks. It is one of two such ships SpaceX employ to recover boosters downrange – alongside the West Coast ASDS, Just Read the Instructions. A third – A Shortfall of Gravitas – is under construction. Landing aboard Of Course I Still Love You came at eight minutes, 32 seconds mission elapsed time. 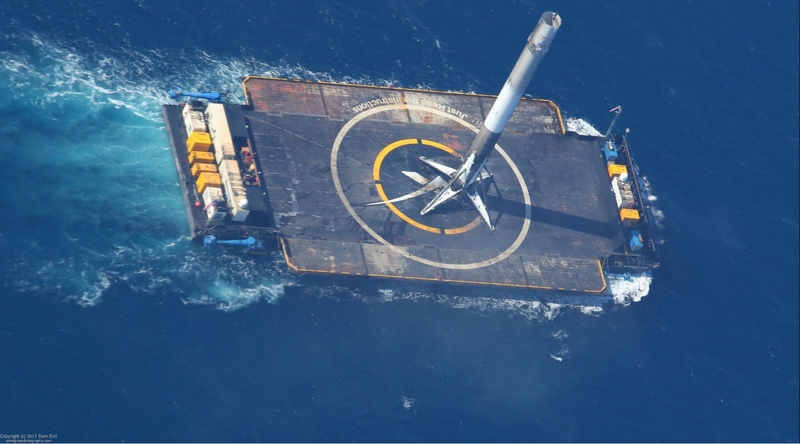 After landing, SpaceX will likely employ a robotic vehicle – known informally as the OctaGrabber – to secure the rocket for transport back to Port Canaveral. The use of the ASDS allows SpaceX to recover the first stage along the trajectory it is flying at the time of separation – eliminating the need to reserve fuel for a boostback burn to change the trajectory after separation and allowing the stage to be recovered even on high-energy geosynchronous launches. The success of the Telstar 18V launch was not defined by whether the first stage is recovered successfully, but by the second stage delivering the satellite to its planned orbit. During Sunday’s mission, Falcon’s second stage made two burns to complete this objective. Its first burn lasted for five minutes and 29 seconds, setting up an initial parking orbit. Falcon 9’s payload fairing separated from the nose of the vehicle about forty-four seconds after ignition, exposing Telstar 18V to space for the first time. While SpaceX has been developing a process to recover the payload fairing – by landing it under parachute aboard a boat fitted with a large net – the recovery ship Mr. Steven is based on California, so was not used on this launch. Despite this, SpaceX may still practice part of its recovery process, deploying parachutes and potentially recovering the fairing from the water after splashdown. Due to contamination from the salt water, fairings recovered from the ocean cannot be reused on future missions. The second stage made its second and final burn after an eighteen-minute, three-second coast period. This forty-three second firing of the Merlin Vacuum engine injected Telstar 18V into geostationary transfer orbit, with spacecraft separation coming at thirty-two minutes and one second mission elapsed time – just over five minutes after the end of the second burn. From its transfer orbit, Telstar 18V will make several maneuvers under its own power to reach a circular geostationary orbit. Sunday’s launch was the fifteenth Falcon 9 mission of the year, and the sixteenth for SpaceX – a number which also includes February’s test flight of the Falcon Heavy rocket. The next Falcon 9 launch is currently scheduled to fly no earlier than (NET) 7 October, when the rocket will deploy Argentina’s SAOCOM-1A radar imaging satellite.